--We are so proud to announce that the amiable and talented champion of no budget films, Kentucker Audley will be 'releasing' In Passing for a limited time on his awesome site No Budge Films. Watch it for free starting May 31st, 2012! 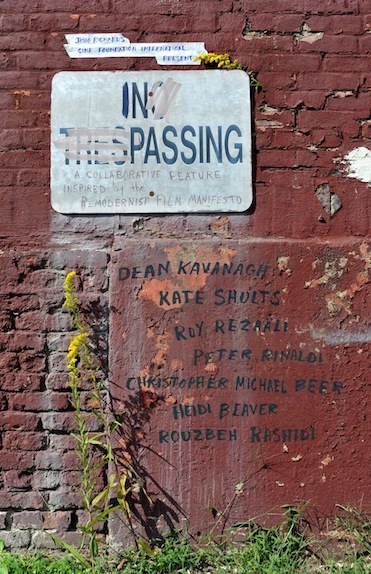 --In Passing will have its World Premiere at the Quad Cinema in New York City on November 13, 2011 (showtime: 1:25pm) as part of the International Film Festival Manhattan. More info to come! "IN PASSING is an admirable work. At times it feels like experimental cinema, or an art installation, or minimalist narrative work, or cryptic documentary work, but it is none of these things, in a way it is beyond them. As an omnibus film, the seven pieces are unified - their exploration of the passing of time, the passage of space, and, more importantly, the "passing" (the imagining, the expression, the extinguishing) of cinema. The filmmakers are working under a "remodernist" designation, complete with a set of 15 "rules". So it's an attempt to renew cinema, to find new forms - as many of the modernist filmmakers of the '60s wanted to do. (And did.) In an age where digital technology has given rise to a proliferation of filmmakers with nothing but commercial dreams in their heads for their moribund creations, this remodernist group of filmmakers is dreaming and believing in something else. And actually doing it. IN PASSING is an intriguing and exquisite work, filled with many delightful elements."